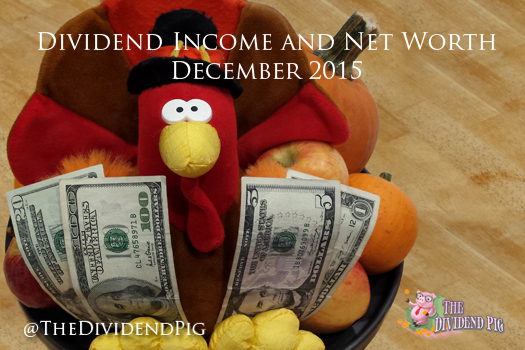 Now that I’m awake from my turkey coma here is the dividend income report and net worth from November. It’s been a heck of a month. Lots of turkey eaten, a family vacation in the books and WAY TOO MANY “good deals” purchased… let’s get to it. This is by far my favorite part of this monthly report. I can’t think of many things more fun than looking back and calculating how much I was paid for zero effort (obviously in the form of dividend payments)! November isn’t a massive month, but certainly nothing to sneeze at either. This month I received $126.13 in dividend payments. That’s a 19.4% increase from August! To be clear, the majority of that 21 buck gain came from the addition of KMI. More importantly, November’s dividend income is a 499.76% increase from November 2014. Small additions to the dividend portfolio really are beginning to add up! The list of this month’s dividend paychecks is below. Here is a link to my dividend stock portfolio and a list of my November purchases. As I mentioned above, this month we took a family vacation and explored NYC for three days. This was my first time visiting the city and we had a wonderful time. A couple of observations, NYC is crowded, expensive and cool. We walked/subwayed for three, long, days and only saw a fraction of the city. It’s amazing to see how people in different parts of the world get around and live. Definitely, not a place I would want to live, but it sure was exciting to visit. I have always thought of myself good with cash. I’ve never lived beyond my means and I’ve never had many wants. Well, i’m afraid looking at my cash position over the last few months has given me an unjustified confidence to buy whatever I wanted and make a snap judgment that “I have plenty of cash”. This month my cash position has dropped considerably, roughly 2.26%. Not because I’ve started the house renovations that I’ve been saving for, but because I was tempted by some “good deals”. First, we went to NYC (a vacation we had been planning). That cost us roughly $1,000. Then, when we got back and black friday was here and I purchased a $350 blender (our blender died), a $400 Xbox One (the system is incredible and worth every penny) and a $450 security system (DIY system that I can take with me when I move and saves me 10 bucks a month in monitoring). See how easy it was for me to justify my purchase decisions! That $1,200 in stuff is the equivalent to roughly 14 shares of XOM or in terms of cash; $41 in yearly dividend payments at XOM current yield of 3.5%. I try to equate all my big buys or monthly expenses into future dividend payments using my calculator. I won’t make those mistakes again. Our house is starting to settle from its huge gains over the last few months (it’s up over 5% since July). Sadly, we still need to do A LOT of work to get anywhere close to that price when we sell, but that’s where a big portion of the cash position will be used. Rental property # 2 has been a headache. Same crap I mentioned last month where the mortgage holder is trying to play games at my expense. I think we’ve got it figured out now and this month the big payoff effort begins. I’m going to work hard to get that one paid off as quickly as possible. After last month’s surprise increase in car values, the vehicles are back on the normal trajectory downward. My wife’s new car fell by 2.4% while my car dropped 2.21%. 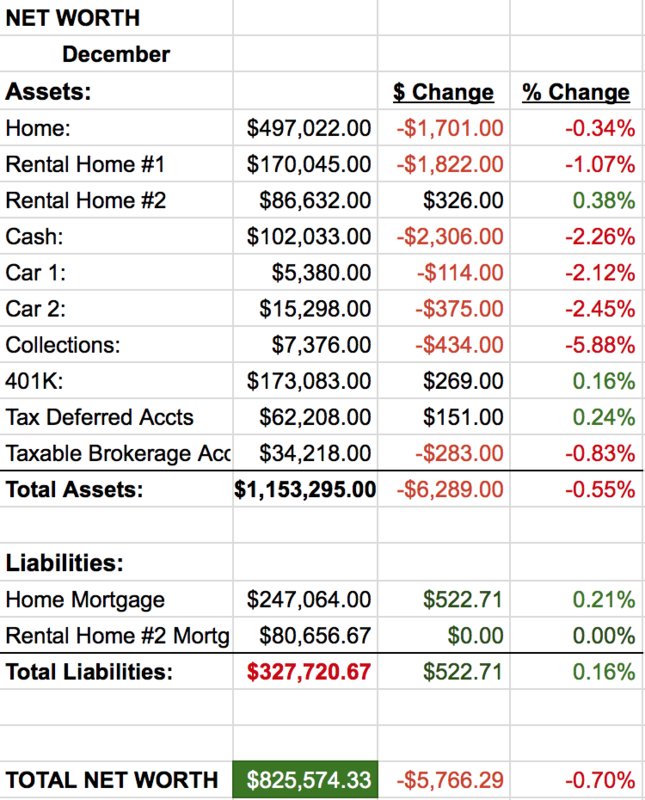 So there you have it, my monthly dividend income and net worth report. Down a bit, but I’m happy to make higher lows. This month should be an interesting one with the FED and their rate raising decision. I’m keeping my fingers crossed for some irrational selling… but of course there is a chance they won’t raise rates and we get a Santa Clause rally. Either way, December should be a fun one. How did you do this month? Do you think the FED will raise rates? Great job! Essentially 500% YoY increase and a 20% QoQ gain is quite impressive. We didn’t make quiet as much progress last month as we’d have liked but that was due to no new investments from lack of capital. Our net worth did a whole lot of nothing just like yours for the month. It changed by a whopping $12. Hoping to get back on track with that to close out the year. Have a great finish to 2015! Thanks! I suspect December will be a great month for the both of us. Perhaps not in terms of net worth, but dividend income should set records!